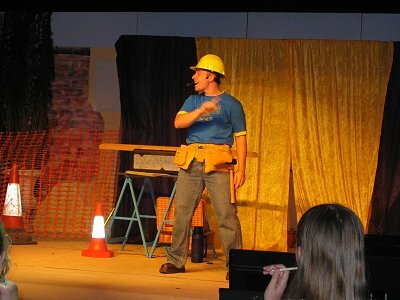 Road shows are aimed at primary school age and often as an all-age event for families. This will involve a mixture of performance and audience participation, be it in helping Jon or in worship and praise together. Jon will bring his own PA and uses music, illusions, puppets and storytelling to illustrate Bible truths and Christian beliefs. This is done in a fun and visual manner. Mixed with this are items included purely to entertain, a balance that has been recognised and appreciated by those who have invited him to their church or school. 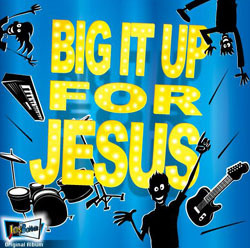 This type of event can be as an outreach or a part of a larger event such as a Bible week holiday club, and lasts from 1 hour up to 1½ hours and can include refreshments afterwards making it a fun filled gospel event. The road show is suitable for both Key Stage 1 & 2 as well as families. Now with the release of Jon’s first CD his road shows uses tracks recorded on this album which also includes songs originally written for his previous ‘God the Builder’ road shows. See the CD page for more details. "Thank you for ‘God the Builder’. You were a real blessing to have around. Your production meant that all ages went away with a positive message and good memories of a church day away." Jon also performs cabarets for teenagers and adult audiences, be it as part of a youth event, park outreach or Alpha Supper after dinner entertainment. He can be the sole act or part of the evenings programme with other artists. This can be with an emphasis on the gospel or just as a wholesome act to be followed by your own choice of speaker. In it, he uses illusion, music and sometimes dramatic monologues to convey his message. He has been involved in a number of church out-reach events from Wadebridge in Cornwall to Winsford in Cheshire as well as park outreach events in Kingswood and Henleaze, Bristol. Jon is also able to help train your workers be it in starting to use puppets, illusions, creative ideas for presenting a message, all-age services, school assemblies, sketchboard and it’s open air use and resourcing. Where do I go to learn more about...? How can I tell a story that involves everyone? How can I bring new ideas to a familiar story? Training seminars can also be combined with a road show. Encouraging church workers in the area to attend training and then bring their children's clubs later on to the event helps create good relationships and unity and brings children from different churches together. Please contact Jon to ask for more details of how he could encourage your ongoing work. 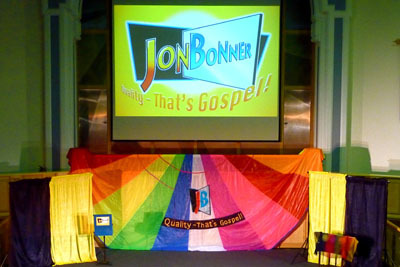 Jon can be the main speaker at a church service, be it an all age family meeting or an evening youth event, for a special occasion or a general meeting. He is also happy to bring just himself and a Bible (without the use of props) and encourage Christians in their daily walk through the Word of God. "Utterly magical – aimed at the right level in every way. Superb for adults and children of all ages. Great for re-enforcing family values and God. Jon is an amazing person, blessed with so many talents – it was a joy to be part of the All-Age worship. Thank you for sharing all your gifts with us."